This was the last of the Butlin's camp to be built and was also the smallest, occupying some 45 acres of hilly land on what was known as Nell's Point, a local landmark in the South Wales town of Barry Island. Plans were submitted and building took place during the winter months of 1965 ready for the camp to open the following year. The construction prompted a wave of local anger, Nell's Point was a popular recreation area and a number of footpaths and roads would be lost if the scheme went ahead. The council, realising the benefits of attracting the camp, went ahead and granted a 90 year lease on the land. The camp settled down to a popular existence and boasted all the usual Butlin's entertainment. Over 800 chalets were built and the camp could accommodate close to 5000 people. A chairlift opened in 1967 and provided a useful transport link up the hill. The site also boasted "the biggest bar in Europe", the Beachcomber Bar - unfortunately destroyed by fire only a couple of years after opening. 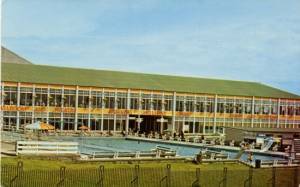 The camp managed to avoid the first batch of closures and in July 1986 Butlin's announced that the camp would be retained and upgraded. They were quoted as saying "All the centres will eventually be upgraded. We have no idea how much will be spent at Barry but there are plans to go ahead there next year, ready for the 1988/89 season". 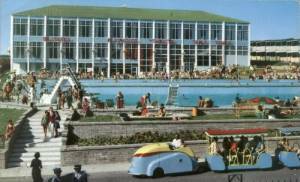 It therefore came as a major shock when, only three months later, Butlin's announced that the camp was no longer included in their plans and was to close. A buyer was found in the form of Majestic Holidays who announced plans for a new £15 million holiday complex. Although the project never came to fruition, the site did reopen and life continued pretty much the same. Investment was kept to a minimum and many of the shops and retail outlets were franchised out to local business people. Complaints about the accommodation led to a clause being inserted in the booking contract which said that visitors could only sue for 20% of the cost of their holiday! A major overhaul of the indoor and outdoor pools took place during the early 90s and the buildings were reclad to give them a new fresh look. The last season for Barry was 1996. Problems with renewing the entertainment licence, along with low bookings and storm damage inflicted during October of that year, finally closed the site for good. The camp lay empty and vandalised. Various ideas and schemes were thrown around, there was even a proposal to turn it into a prison! The council, already being the landowners, eventually purchased the camp for £2.25 million and proposed redevelopment as "a recreational facility, open space and an area of varied housing development". Many of the old structures and chalets were torn down although some buildings, including the Regency and the Gaiety, were retained. The outdoor pool even opened up again for a brief spell before closing down. The remaining buildings and swimming pools were left disused and falling into disrepair. A new housing development resulted in over 250 homes being built on the rest of the site (again after much local opposition) and the remainder was landscaped and left for recreational purposes. More recently, in 2005, the remaining buildings were demolished and the site was finally cleared.